Welcome to the Netherlands Portal! The Netherlands is one of four constituent countries in the Kingdom of the Netherlands. The Netherlands is a parliamentary democracy under a constitutional monarch, located in northwestern Europe. It borders the North Sea to the north and west, Belgium to the south, and Germany to the east. Since 2010, the Caribbean islands of Bonaire, Saba and Sint Eustatius have become part of the country of the Netherlands, whereas Aruba, Curaçao and Sint Maarten are considered separate countries within the Kingdom, however only the Kingdom functions internationally as a sovereign state. Although the Netherlands is often referred to as Holland, this use is strictly incorrect, as Holland is a region in the central-western part of the Netherlands, consisting of only two of the country's twelve provinces. The country's constitutional capital is Amsterdam, but the seat of government is in The Hague. The Hague also locates most international embassies, as well as the International Court of Justice and the International Criminal Court. The Netherlands is a very densely populated and geographically one of the most low-lying countries in the world (its name literally means "Low lands") that is popularly famous for, among other things, its dikes and canals, windmills, wooden shoes, tulips, bicycles and social tolerance. Its liberal policies, for instance regarding drugs, homosexuality or prostitution receive international attention. As of 2014[update] the country ranks fourth in the world on the United Nations Human Development Index, or third on the inequality-adjusted H.D.I.. The Netherlands also ranked as the fourth happiest country in the world in the U.N.'s 2013 World Happiness Report, reflecting its high quality of life. Museum de Oude Wolden is a regional museum in the village of Bellingwolde in the Netherlands. The museum focuses on art and history of the regions of Oldambt and Westerwolde. It opened on 10 August 1973. In the first decades, it primarily exhibited historical objects documenting everyday life. In the late 1990s, the museum started to exhibit artworks of artist collective De Ploeg and magic realist painter Lodewijk Bruckman. Since 2012, it has a permanent display of paintings by Bruckman and temporary exhibitions. The municipality of Bellingwedde employs the museum staff and provides most of the museum's budget. Since 2003, the museum had around 1,800 to 3,200 visitors per year. With 1,798 visitors in 2012, when the museum was partially closed for renovation, it is one of the lesser-visited museums in Groningen. The Keizersgracht and the Reguliersgracht are canals in Amsterdam. In 2010, the 17th-century canals of Amsterdam were placed on the UNESCO World Heritage List. ... that Dutch Nuna solar racing team, guided by former Space Shuttle astronaut Wubbo Ockels (pictured) won the World Solar Challenge six times out of the last eight events ? ... that The Hague is home to over 150 international organisations (including NGOs) working in the field of peace and justice ? ... the Netherlands is a very densely populated country for its size ? With 406 people per km² – or 498 if inland waters are excluded – only Bangladesh, South Korea and Taiwan have both a larger population and a higher population density. ... the Netherlands is nevertheless the world's second largest exporter of food and agriculture products, after the United States ? ... and that it has the most plentiful, nutritious and healthy food, according to a 2014 comparison of 125 countries by Oxfam ? ... a UNICEF report published in 2007 ranked the Netherlands as the best country for children to live in ? ... the Netherlands also exports more flowers and flower bulbs than the rest of the world combined ? ... the KLM is the longest running national airline in the world ? ... the Port of Rotterdam was the world's busiest port from 1962–2002, and is now still the world's largest seaport outside of East Asia, measured by total cargo tonnage handled ? ... that two major clusters of flood control and land reclamation projects: the Delta Works and the Zuiderzee Works, were declared one of the Seven Wonders of the Modern World by the American Society of Civil Engineers. ? ... of which the Maeslantkering storm surge barrier is one of the largest moving structures on Earth ? ... of which the 1932 Afsluitdijk is still one of the world's longest dams and causeways ? ... and of which the Flevopolder, at an area of 970 km² (370 sq. mi), is by far the world's largest artificial island ? 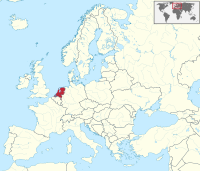 This page gives an overview of all featured content ( ) on Wikipedia related to the Netherlands. The Dutch Wikiportal is currently under construction. Help would be greatly appreciated! The Dutch Wikipedians' notice board. Add yourself to the category of Wikipedians located in the Netherlands. You are invited to participate in the WikiProject Netherlands, a WikiProject dedicated to developing and improving articles about the Netherlands.